As a Christian and political conservative, I wince nearly every time Donald Trump opens his mouth. But the hyperbolic liberal knee-jerk fear reactions to Trump’s every stupid statement, and his “surprising” popularity reveal something interesting – that liberals, and many moderates, just don’t get conservatives at all. I personally attended a TEA Party rally, and not only were there a few (too few) black supporters there, they were welcomed, praised and thanked for their courage to buck the slurs of Uncle Tom from liberals, and generally included without further regard for their race. If you ask me, open carry advocates go beyond the pale when it comes to the Second Amendment, but nevertheless, in open carry states, TEA Party attenders proudly displayed their right to carry a gun. The problem for liberals? Except for a few minor incidents, no violence or shootings occurred. 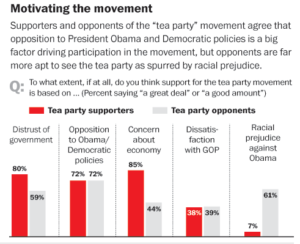 But this lack of evidence did not stop liberals from viewing the TEA Party as potentially violent. They were partly right – because Second Amendment conservatives are willing to use their guns – but not in fearful racist or anti-government rage, but as a valid, principled, and last resort against government tyranny. Liberals fundamentally miss the restraining principles within the conservative mindset, and think we are going to act as they would. But we don’t. Here’s a very important factor in the liberal misunderstanding of conservative gun advocates. 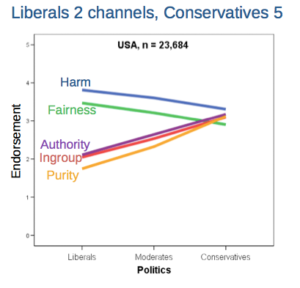 Liberals project their value hierarchy onto conservatives, and then fear what they see. And well they should, if conservatives shared their values. in that they trust humans less, and so limit their freedom more in order to safeguard society. They believe that if everyone had a gun, we’d be the old west, with a shootout on every corner. They certainly would not want to ask people to develop virtues like self-control (not to mention chastity or modesty). And so when they see conservatives with guns, they jump to the conclusion that violence will erupt. Except it almost never happens (as it does at liberal gatherings where vandalism is a mainstay). Conservatives stress responsibility and freedom (again, valuing moral strength), and so promote gun use for protection and insurrection. But they are not keen on insurrection, only as a last option. Those steeped in the ideas that brought the bloody French Revolution think revolution is nigh in these communities, but conservatives again have restraining principles and values that liberalism lacks. 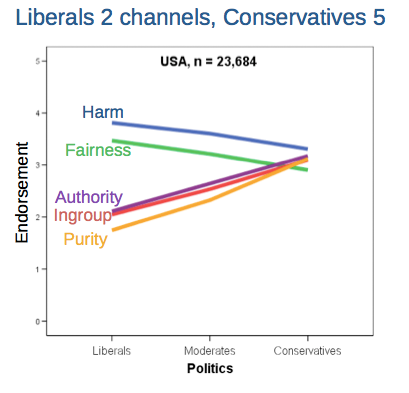 But they project onto conservatives their own value system, and so poorly evaluate the risk. With a firm reliance on the protection of divine Providence, we mutually pledge to each other our Lives, our Fortunes and our sacred Honor. We are willing to die for our freedoms, and take the admonition of Jefferson to heart when resisting tyranny – and the initial tyranny of Britain over the US was merely about taxes and quartering soldiers, mainly, not anything as serious as disarming us. Trump Guilty of “Stochastic Terrorism”? His remark was careless, but I do not think intentional incitement, though some edge crazies may take it that way – that is a real, if not slight risk. Let’s not give Trump too much credit, but he may have actually been referring back to gun advocates last choice – as advocated by Jefferson – to overthrow the government if it the Trump campaign fails to attack the corruption. He was more likely referring to the main principled motivation behind gun advocacy – protection from tyrannical governments, and a willingness to preserve freedom with the cost of our lives. That is, he was making an inside joke to conservatives, who have no intent on killing the president (if Obama has survived all of the conservative hatred and supposed racism without an attempt on his life, perhaps we’ve overestimated the hate), but who understand that Trump’s campaign is in many ways a last ditch effort to break up the hegemony of corruption in our government. 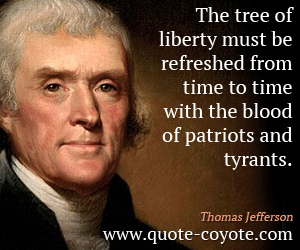 If that fails, we may be left with only Jefferson’s suggestion. Trump is a loose cannon. In a nuclear world, that’s the last thing we need. But when he attempts to make a half-serious overture of understanding to gun advocates, he is not intentionally, nor actually encouraging the rank and file to kill Hillary. Because conservatives (unlike by comparison, liberals) have a respect for authority and law, there is no real conspiracy to kill Hillary that we have to be careful not to feed. This isn’t Islam.